Captivatingly talented with her voice and spiritually authentic in her message, rising Gospel artist Bami brings us on a modernized journey into the realms of uplifting our Faith in God with her much awaited versatile new EP Streaming Of His Grace. Bami‘s sound is explosive, multifaceted and graciously fun with a ton of multi-genre additives and flavorful beats on this 4-track record. Her electronically-infused sound combines an array of funky riffs, hypnotic jazzy tempos and a salsa/tropical and Latin edge that brings out her voice very effectively and tastefully. 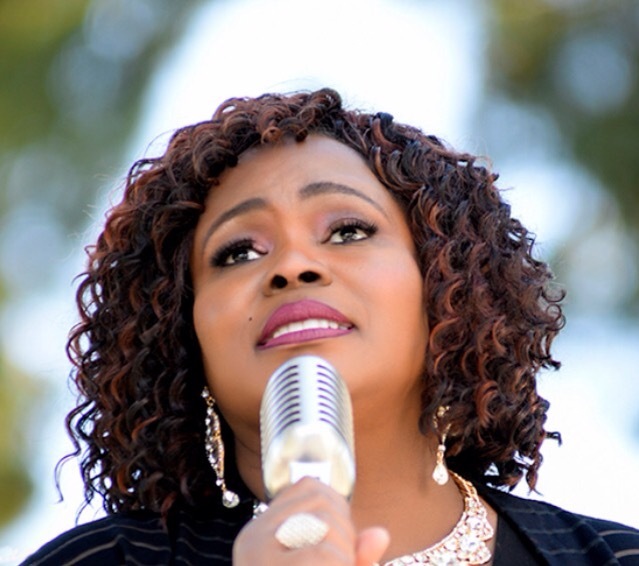 Her mid-ranged voice tackles very spiritual content about her Faith in the Lord and really brings a new and fresh approach to the legacy of Gospel music with her compellingly dynamic production and highly intricate song structures. Delving into the songs themselves, the musicianship factors are unwavering. The rhythmic tempos are extremely neat and tidy and grasp onto composition techniques reminiscent of many jazz and fusion eras, but that’s just one of many components. Her Pop elements also add to the intuitive song structures and really helps carry Bami‘s voice in a way that is front and center, with very tasteful melodies in her vocal approach that resonate perfectly with the bluesy rhythms and chord progressions. This is a modern day triumph of Gospel music that could easily take on a life of its own, and really showcases an amazing range of production techniques and songwriting structures that are rare in Gospel music, if not new altogether. The most striking part of Streaming Of His Grace is the originality. The record does not emulate any other artist and Bami really delves into a signature sound that is in her own right. You can draw comparisons to her if you think hard enough, but there’s no question that her approach in Gospel is anything but ordinary. If you’re looking for a spiritual record that is also musically fascinating and compelling, then Streaming Of His Grace will absolutely blow your mind. There’s a new queen of Funk in town, and she is heating up the streets. That queen’s name is Natasha Cash, who comes out swinging with her inspirational new single “Don’t Stop Tha Music”. From swagger dance moves, an angelic vocal range and an eclectic blend of Funk and R&B at the forefront, Natasha‘s single, accompanied by a fun and colorful music video, pulls out all the stops to make sure that the show must go on in “Don’t Stop Tha Music”. With very elegantly crafted melody placements and a vocal vibrato that puts a glistening signature touch over Natasha‘s mid-to-high ranged approach, this fun single embraces elements from the good old days of the Motown era and today’s more tastefully modern mainstream sensibility. It’s innovative, flavorful and really showcases multifaceted angles from both yesterday’s funky favorites and today’s modern R&B anthems. The song has great pacing, a precise rhythm section and top of the line production value to really bring out the best of Natasha Cash‘s vocal abilities. One standout about the video is the authenticity – the fun, humble feel and free spirited nature that really resonates with the song. It’s all about vibes, and this video proves that it’s all good when it comes to keeping the vibes real. And that’s what Natasha brings to the table in this song and video – a real and authentic vibe with her blissful gift of voice. And she really shines like a diamond in “Don’t Stop Tha Music”. This track has endless likability factors, and Natasha Cash is at the heart of every single one of them. And once you take a listen to this single yourself, you’ll see (and hear) exactly why we crowned her as the new queen of funk. If you’re in the mood for something funky, bluesy, with a shredding Gibson Les Paul and finger-snapping backup singers, then TLife’s politically supercharged anthem “Rougher & Rougher” is your new favorite song. With a cinematic-worthy music video to accompany this track, “Rougher & Rougher” is an exercise of something contagiously catchy, yet real at the same time in both musicianship and content. With lyrics reminiscent of real-life worldwide issues, T Life’s charismatic vocal range carries us through a narrative that touches on both originality and familiarity; along with visuals that take us through his powerful message as he sings it, making the video and audio equally effective and compelling. TLife’s signature sound and stylization definitely puts his veteran musicianship angles right to the forefront. His vocal delivery has an impressive range and parallels perfectly with his image and genre. He brings the classic 70s funk era to the modern age without saturating it or plagiarizing it, he puts a whole new twist on a genre that has never been forgotten. If anything, TLife is continuing it in a whole new dynamic. He is well acclaimed, has been around the world and back, and really showcases himself intensely with “Rougher & Rougher”. And when you hear this track for yourself, you’ll definitely see where we’re coming from. You’ll just fall head over heals with this song, and that’s a promise we can keep. Charismatic, fun, with a funky vibe. Singer/Actress Rachael Hadassah hits us with a positive message on her fresh sounding single “Ain’t Nothing’s Gonna Stop Us”. Jumping fresh into a music career, you might also recognize Hadassah from films like Amazon Prime’s Misunderstood Sadie, Anykah, and the dark twisted comedy Terrorizing the Todd. But now shifting from in front of the cameras to the front of he microphone, we capture a portrait of a very versatile and determined artist. This single definitely has a fresh city club vibe to it, and garners elements of Hip Hop, and old school R&B with a 90s feel. The chorus delivers us a very catchy and identifiable presence that puts a fresh balance between charisma and texture when it comes to Hadassah‘s vocal range. Her vocals stand very close to the forefront and really put a witty edge to her overall execution of this song. She definitely encompasses the passion that most artists lack nowadays; you can tell she’s not just after some money grab. She is an aspiring artist truly ready to come out of her shell and shine like a gem. And “Ain’t Nothing’s Gonna Stop Us” is a great indication that nothing’s gonna be stopping Rachael Hadassah‘s drive for success anytime soon. The new Queen of Funk has entered the building. And carries with her not only the crown, but a sound that electrifies Funk and Blues in a whole new direction. Lettrice Lawrence has a sound that I’d like to classify as Funk-Tronic in her track “Get Outta My Way”. A self confident track that has an EDM touch to her Soul Food for the ear. And her voice definitely brings out the Soul and solidification to this eclectic sound, with some key influences that can be heard from other Soul/Blues and Funk Legends such as Earth Wind & Fire, Luther Vandross, and Anita Baker. It’s a great new generation sound that has those key influences implemented into a very charismatic vocal approach with vivacious delivery in her Tone and Range. Her next track, a story-teller called “My Man” speaks for itself with its title. This one has a more traditional sound and a great blend of clean guitar tones that are great cornerstones for Lettrice‘s vocal delivery. You can almost deem this song as the Female version of Jimi Hendrix’s “Hey Joe”. And to pull that off is what really makes Lettrice worthy of the crown. It’s a vicious vocal attack, a Bluesy and Progressive masterpiece, and can easily be performed to a sold out crowd at Harlem’s Apollo Theater. Make no mistake, Lettrice Lawrence knocked me off my shoes with the elements and dynamics from both tracks. And if that was her intention…well done. Now us at Artist Reach want more. And after you take a listen to Miss Lawrence yourself, so will you.